At the end of the spring, when Cuc Phuong forests is full of sunlight, flocks of butterflies seem to wake up after a long sleep through a chilly winter – spring. Cuc Phuong National Park is located on the territory of the three provinces of Ninh Binh, Hoa Binh, Thanh Hoa. For a long time, this has been the resort for many domestic and foreign tourists with destinations such as the prehistoric-man cave, the thousand year old oak tree, primate rescue center. The road into the forest. However, not everyone knows that Cuc Phuong owns a seasonal specialty. Nature has endowed Cuc Phuong a priceless gift which is hard to be seen in other places in the S-shaped land. 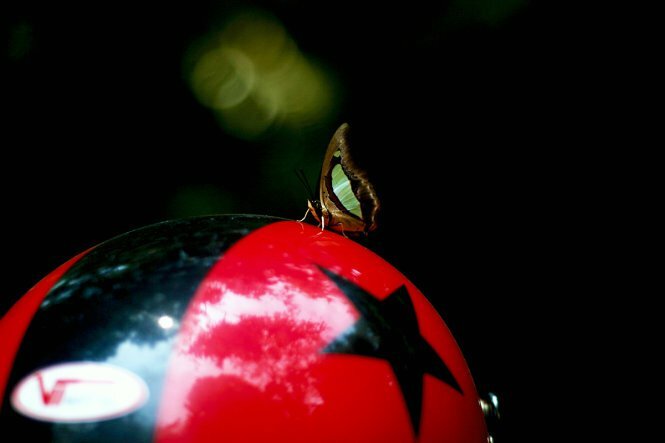 Cuc Phuong butterflies are numerous with high diversity, ranging from swallowtail butterflies to green wings ones ... 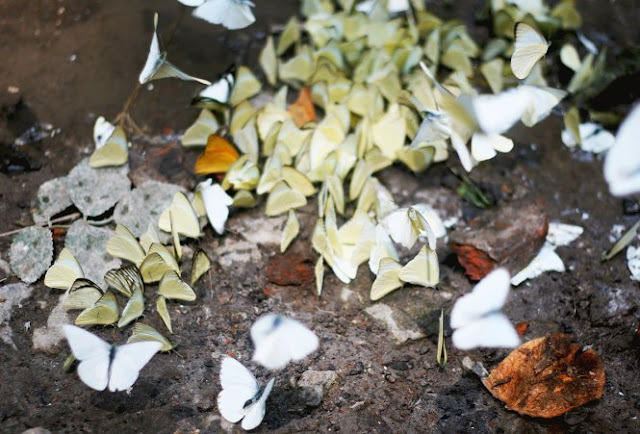 But the most popular ones are white butterflies and yellow butterflies. Each flock of butterfly flies in a line as strolling around in the forest, in the music of nature. 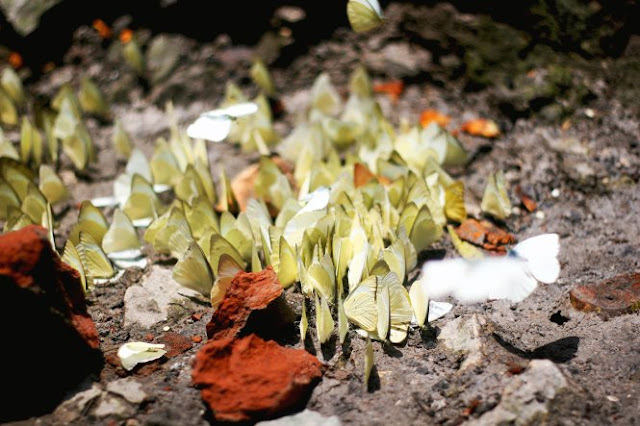 Butterflies in Cuc Phuong are especially numerous at the end of spring and at the beginning of the summer when everything is awake after a long sleep through the chilly spring- winter. Butterflies often fly out of lush trees in the forest to enjoy sunlight. 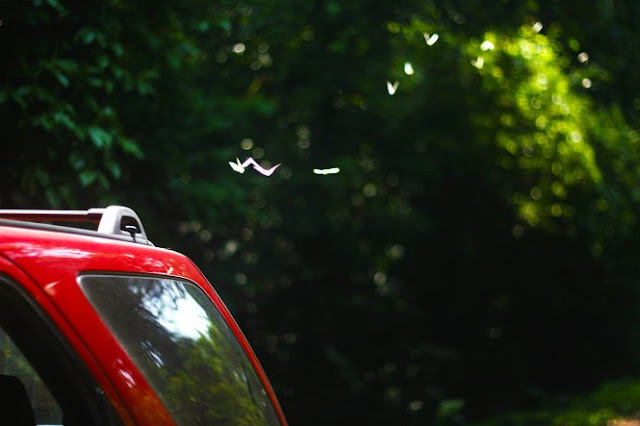 So if you travel to Cuc Phuong after rainy days, you could easily meet butterflies gathering into large flocks along two sides of the forest. 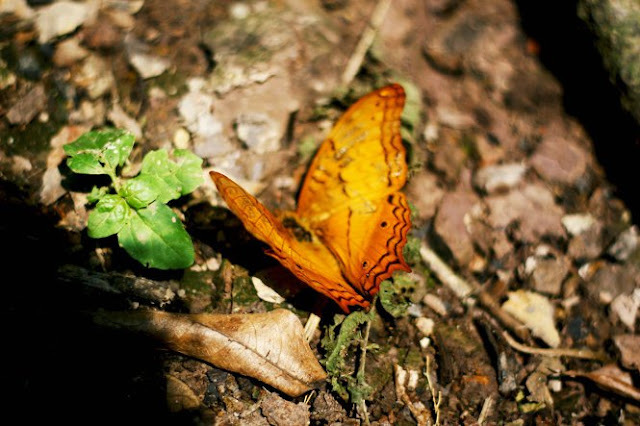 As soon as you enter the gate, you will see butterflies flying from the gate to welcome tourists and then lead them to venture into the forest. Driving along the small road leading to the stopover in the forest, you will feel like you are flying with flocks of butterflies. Sometimes, they perch on the shoulder, the helmet and on the mirror of the motorbike. 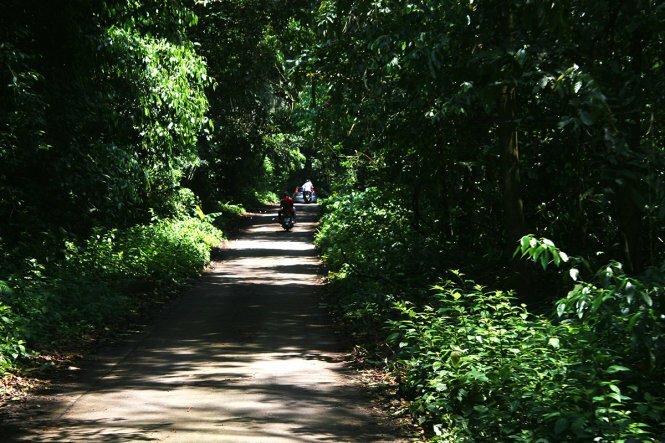 Upon reaching the middle of the forest, coming up to our eyes is the surprisingly beautiful scenery. A flock with hundreds of butterflies gathers on a plot. There are all kinds of colors from white-yellow to blue, brown or pink. The deeper and deeper we reach, when the road leading to the thousand year old oak tree is only around several kilometers, there are more and more butterflies. 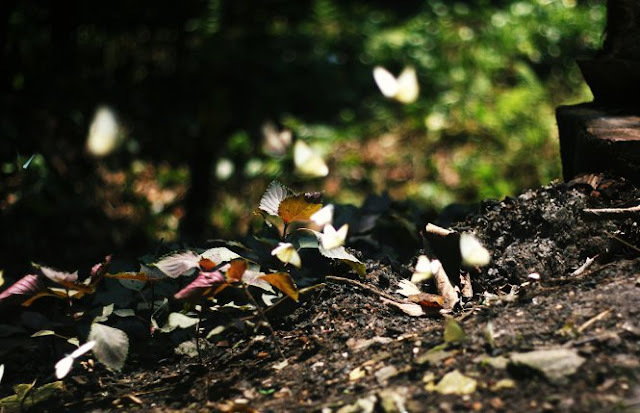 In the afternoon, butterflies become gradually sparse. After walking out of the oak tree, everyone is tired. After a short rest, we leave Cuc Phuong. The way back is still beautiful with lovely butterflies flying along. 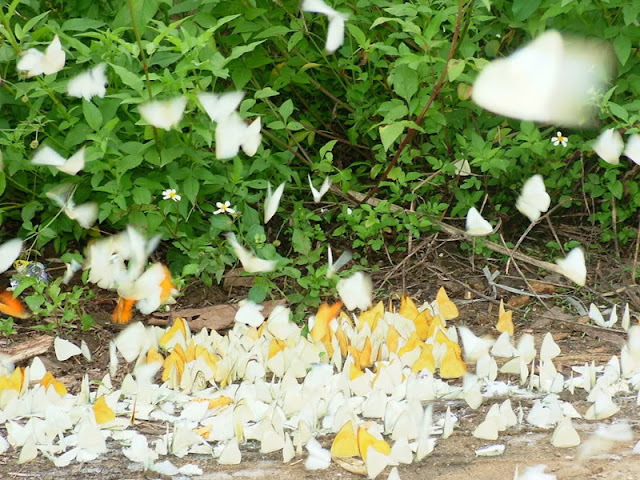 The scene is dotted with several yellow butterflies. The color of butterflies is mixed with the color of leaves. 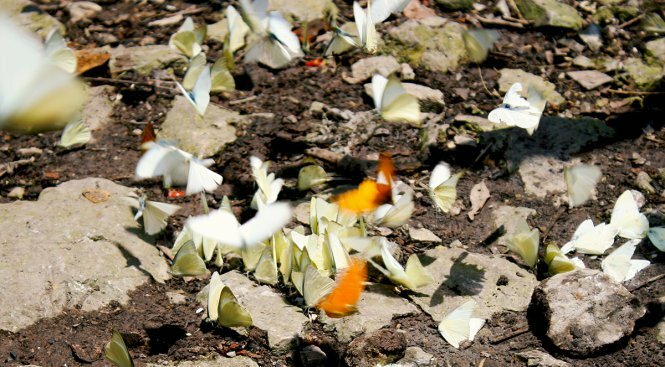 The scenery of the forest brings a new color with the presentation of a huge flock of butterfly.